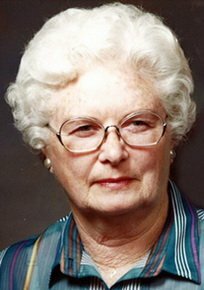 WAVERLY - Virginia Nellie Becker, 90, of Waverly, formerly of Plainfield, died Friday, Oct. 9, at Bartels Lutheran Retirement Community, Waverly, of natural causes. She was born Nov. 12, 1918, in Waterloo, daughter of Ellsworth M. and Luella E. Leversee Howe. On June 7, 1942, she married Robert J. Becker at her parents' home southeast of Janesville. He died Nov. 29, 2001. She graduated from Cedar Falls High School in 1936 and received a B.A. in education from Iowa State Teachers College in 1940. Mrs. Becker and her husband farmed. Survived by: three sons, Bruce (Linda) of Plainfield, Robert Jr. (Lynda) of Swaledale and Todd (Shirlee) of New Hampton; three daughters, Kathy Bobst of Hampton, Linda Moeller of Readlyn and Virginia (David) Wilhelmi of Pine City, Minn.; 17 grandchildren; 11 great-grandchildren; and a brother, Ralph Howe of Clemons, Va.
Preceded in death by: two sons-in-law, James Bobst and Dennis Moeller; and a brother, Forrest Howe. Memorial services: 2 p.m. Oct. 18 at Plainfield United Methodist Church, with inurnment at a later date in Washington Chapel Cemetery, rural Cedar Falls. There will be no public visitation; she donated her body to the University of Iowa College of Medicine. Kaiser-Corson Funeral Home, Waverly, is assisting the family. Memorials: may be directed to Cedar Valley Hospice, Bartels Lutheran Retirement Community or the donor's choice.